As you know, to have a dog is a great responsibility. Every responsible and self-respecting dog owner should take care of his little friend. The first thing that he needs to do is to choose the proper food and place for the dog convenient and healthy life. But, to choose the right equipment for your doggy is also very important. Do you know how to measure a dog for the most comfortable, well-fitting collar? 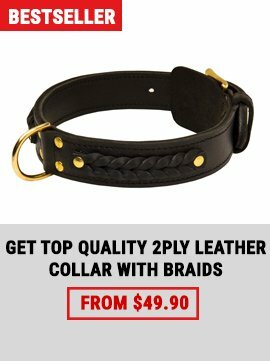 Do you know what type of collar is better to choose? Should it be leather or nylon, classically designed or extraordinary? The first step before selecting any collar should always be a talk to a specialists. They will inform you how to measure your dog for the collar not to be too close. The second step is to talk to a veterinarian. He or she can take your dog's medical characteristics into account and make sure you are keeping your dog safe! It is not a simple choice, isn’t it? 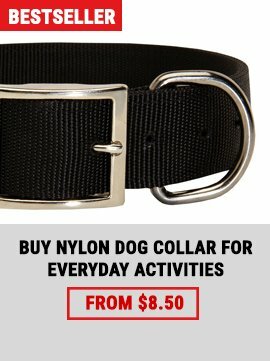 So, if you haven’t chosen the right collar for your pet, we wish you good luck. Collar that will always be in fashion! With or without this extremely patriotic painting this collar is the top of expectations. If you are looking for a thing that will be in use for years and at the same time not look like others, you may already stop searching. 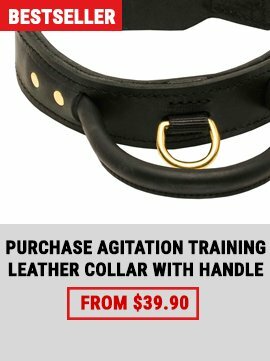 Why are we so sure that this collar is so durable? It is rather easy! We select the best materials for creating dog accessories and consider peculiarities of usage of these accessories. 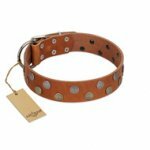 This is an absolutely Gorgeous Leather Collar for handling small, medium size and large dogs. This laconic classy design performs a well done professional training accessory for everyday use. This collar is a worthy purchase for a pretty decent price! 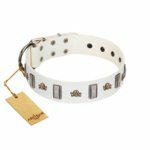 Our collars are made of high quality materials that are rather costly. 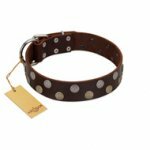 But we can offer you a good price because we have our own manufacture where every collar is handcrafted by our masters.